The story began with a small yellow insect. It developed, 100 years ago this month, into the biggest civil revolt in France in the 20th century. By comparison, the events of May 1968 look like a modest squabble over the right of French youth to wear purple trousers and long hair. The Southern Wine Revolt of 1907 generated vast demonstrations (up to 800,000 strong), three days of anti-government riots and six deaths at the hands of the military. The rebellion seemed to threaten at one point the secession of Languedoc and Roussillon - the great wine growing area along the Mediterranean coast - into an Occitan, rather than French-speaking, breakaway state. At the height of the crisis, on 20-21 June 1907, a local regiment mutinied and joined the protesters. to this day. It is now under threat from problems in the domestic and international wine industry which uncannily recall some of the grievances which led to the rebellion 100 years ago. The 1907 wine revolt is largely forgotten in most of France but not in Languedoc and Roussillon. A series of official, commemorative events is planned in towns across the South this month. Less official commemorations are threatened by a shadowy movement of radical wine producers, the Comité Régional d'action Viticole (Crav). To protest against the collapse of wine prices and the huge, unsold stocks of local wine, this movement has committed acts of low-level terrorism in the past two years. As recently as last month, Crav exploded small incendiary bombs outside supermarkets and government offices in Languedoc. A few days ago, hooded Crav members solemnly read out a call to arms before a local TV crew. "Wine producers, we appeal to you to revolt. We are at the point of no return. Show yourselves to be the worthy successors of the rebels of 1907, when people died so that future generations might earn their living from the land." Some scattered acts of violence are likely in the coming weeks. The chances of a mass revolt like that of 1907, involving everyone from big town mayors to vineyard labourers, are nil. A hundred years ago, wine was the life-blood of Languedoc. It provided, directly or indirectly, the wealth of the bourgeoisie, the economic raison d'être of every town and village and the bread in the mouths of the poor. A hundred years on, wine is still important. The grievances of local wine producers are many (and some of them justified). But the wine industry has become just one source of wealth in a patchy but locally booming regional economy, dependent on everything from tourism to cereals, car parts to computers. A celebrated local historian and wine producer, Jean Clavel, told The Independent: "A century ago, wine was Languedoc and Languedoc was wine. The 1907 revolt was a revolt for the survival of a whole region - and against the apparent indifference of the authorities in Paris. "Much has changed today. Such a rebellion, by a whole people, is inconceivable. But there are many fascinating parallels between the 1907 rebellion and the problems we have in the wine industry today, in Languedoc and in the whole world." Everything begins with an illegal immigrant from America: a small yellow aphid, the "grape phylloxera" or Daktulosphaira vitifoliae. From 1863, when it was first discovered in the Gard département around Nîmes, the insect progressively chomped its way through every vine in France and, then, Europe. The vines were eventually replaced by varieties from America, which had a native resistance, and then by European grape varieties grafted on to American roots. 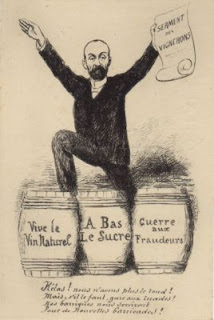 By the time that the Languedoc wine industry had recovered in 1900, the mass market for cheap drink for the industrial working classes had been invaded by wine from French colonies in north Africa and by absinthe. Above all it had been inundated by "sugared" wine from other French regions, using a new process for artificially boosting yield and strength discovered by a French scientist, Nicolas Chaptal. Languedoc and Roussillon - broadly the area from the River Rhône to the Spanish border - had always been dependent on the mass market for coarse red wine. Other wine regions, such as Bordeaux and Burgundy, recovered their market for finer wines relatively easily. Languedoc - which was also guilty of blindly boosting its own post-Phylloxera production too far - found itself in a spiral of unsold stocks and rock-bottom prices. All sorts of political factions and forces attempted to channel the revolt which began, relatively peacefully, in March 1907. The Royalist ultra-Catholics thought that they might use the grievances to bring down the secular republic. The radical republicans saw the beginnings of a peasant-worker revolt against bourgeois power. The militant defenders of the language of the South, the Langue d'Oc, still widely spoken in 1907, saw an opportunity to wrest regional autonomy or even independence from Paris. One of the strengths of the 1907 revolt - but finally its limiting factor - was that it resisted all these factional influences and remained a broad-based, regional howl of economic pain and anger. This was largely the work of the main leader of the rebellion, Marcelin Albert, 56, a cafe-owner and small wine producer. 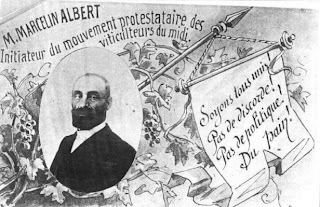 M. Albert came to be regarded as a kind of Languedocian Robin Hood or William Tell, a saintly defender of local rights against brutal and unthinking central power. The "apostle of the wine producers" successfully eluded attempts to arrest him and then turned up in Paris at the height of the crisis and demanded to see the prime minister, Georges Clemenceau. The wily Clemenceau, later a national hero as wartime prime minister, ran rings around M. Albert. He persuaded him to call an end to the revolt and lent him 100 francs for his train journey home. When this emerged - especially the detail about the 100 francs - M. Albert's reputation never recovered. The protests began with a demonstration by 300 people on 24 March. By 9 June, 600,000 people - by some estimates 800,000 - had blocked the streets of Montpellier (10 times the town's population). M. Albert's organising committee persuaded more than 300 local mayors and town councils - including those of most large towns - to resign en bloc. Local government was closed down. Town hall doors were bricked up. This, even more than the demonstrations, was seen by Paris as a direct threat to the rule of law, the constitution and the Republic. Clemenceau, known as "the Tiger", opted for confrontation. He ordered the arrest of M. Albert and his committee, and the recalcitrant mayors, even though the protests had been peaceful up to that point. Several regiments of troops, including cavalry, were ordered into the region. On 19 June, huge crowds turned out in several towns to stop soldiers taking arrested committee members and mayors away. The cavalry were forced to draw their sabres. Scuffles broke out. Officers were pulled from their horses and beaten. In Narbonne, the sous-préfecture, or national government office, was set alight. Barricades appeared on the street. The cavalry charged. Shots were fired by soldiers at a cafe terrace, killing one person and wounding six, including a 14-year-old boy. The next day a policeman who had arrested the mayor of Narbonne was stripped naked by a mob and thrown into a canal. As the crowd surged towards the town hall, soldiers of the 139th regiment of infantry panicked. Their officers had strolled away to eat their lunch in a restaurant. Fearful for their own lives, the soldiers fired in the air and then directly at the mostly unarmed protesters. Five people were killed, including a young woman, Cécile Bourel, 20, who had been shopping at the Narbonne market and followed the crowd out of curiosity. The préfecture at Perpignan - the main regional seat of national power - was burned to the ground that night. The 17th Infantry Regiment, mostly local recruits, heard of the deaths while stationed on the coast at Agde. Their officers were, again, absent, eating and drinking in local cafés in civilian clothes. About 500 soldiers mutinied and marched on Béziers. Outright civil war, even a southern secession, seemed briefly to threaten. The action of the 17th has since entered into France's rich folklore of resistance and rebellion. In truth, the soldiers appear to have been unsure what to do next. Within 24 hours, without firing a shot, they accepted an amnesty and a promise of no punishment. Most were rapidly thrown out of the army or sent to miserable postings abroad. It was at this point that Marcelin Albert abruptly appeared in Paris and demanded to meet Clemenceau in person. The prime minister agreed and then mendaciously told the press that the "wine apostle" of the South had broken down in tears and begged for a way out of the protests. M. Albert furiously denied this but his reputation as a saintly "redeemer" was ruined. The revolt petered out. By the end of the following month the parliament passed a series of laws increasing the tax on sugar, limiting the sugaring of wine and imposing rules for the first time on the declaration of wine harvests and sales. None of this began to match the demands of the protesters. The wine market improved but only slowly. There was a similar revolt by producers in Champagne in 1911. War intervened. Then in 1919, France introduced its first "appellation" or naming rules for the production of wine - imposing strict local and regional boundaries, methods and grape varieties - which survive in amended form to this day. All in all, the Great Revolt of 1907 was a very French affair: a mixture of moderation and extremism; a contest between local pride and suffering and central government arrogance and neglect. The solution, initially part-muddle, part-confidence trick, led eventually to an elaborate system of classification of wines which did much to make the international reputation and success of French wine. That system is now under some threat. The 463 different appellations are the joy of wine buffs but - often - the despair of non-experts looking for the same reasonable bottle that they found in Tesco or Oddbins a month ago. Simply-labelled New World, Italian and Spanish wines have taken a large share of the middle-of-the-range wine market. Languedoc and Roussillon have made enormous efforts in recent decades - more than any other French region - to move with the world market. Large areas of vineyards which produced unsaleable, red rotgut have been grubbed up. From 400,000 hectares of vines in 1970, Languedoc-Roussillon has dropped to only 280,000 hectares. Much of what remains has been converted to better appellation côntrolée wines or to reliable, "grape variety" wines on the Australian model: chardonnays and cabernet sauvignons and merlots. The reward for all this effort and sacrifice has been another wine crisis, which is largely not of Languedoc's doing. Production in other countries has boomed. So has production of poorer and medium quality wines in other French regions, especially Bordeaux. This boom in production is based partly on - irony of ironies - the chaptalisation, or sugaring, of poorer wines: something that Brussels now wants to ban but Paris is determined to cling on to. "The parallels are obvious," said the Languedoc wine historian and producer, Jean Clavel. "Chaptalisation is a menace for us. Centralised decision-making on the wine trade is bad for us. But the interests of Languedoc are ignored because of the more powerful lobbies elsewhere. Just like in 1907."